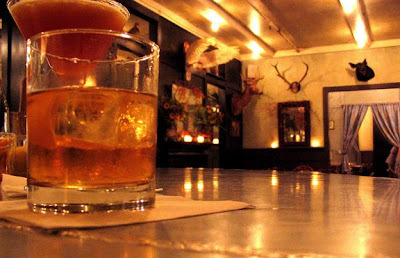 Last Halloween, saddled up at the cozy bar inside Freemans, I fell in love. 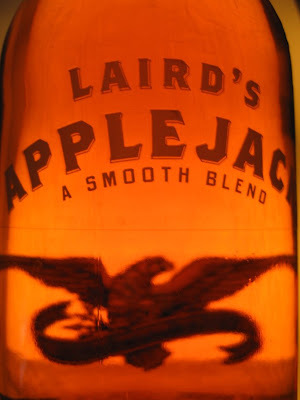 My drink contained Applejack, a colonial "cyder spirit" from Laird & Company that Johnny Appleseed himself once taught his congregations along the Ohio River Valley how to produce. Technically an apple brandy, when mixed Applejack can take on more of a caramelly bourbon role. Try it on the rocks with rye whiskey, in place of brandy in your favorite cocktails or on its own. Lately I've been enjoying mine like this..
Pour the Applejack and bourbon into an old fashioned glass, add bitters, then two or three ice cubes, and top with apple cider. Stir gently. Other delicious Applejack cocktails from some inspired mixologists.. Shake together all ingredients and strain over ice into a rocks glass. Garnish with a bitters-soaked apple wedge. Shake well with ice, strain into chilled cocktail glass that’s been rimmed with cinnamon sugar. Top with champagne, if you like (be sure to goose up the sweetness a little to compensate for the extra acidity), and for the holiday go ahead and garnish with a cranberry. Build in an old fashioned glass. Give a little stir, a big chunk or two of ice, another little stir, then garnish if you like. * If you can’t find the barrel-aged bitters, then Fee’s Old Fashioned Aromatic Bitters will do (or, Angostura in a pinch). But really the Whisky Barrel Aged Bitters is an exceptionally fine product. If you can’t find it where you live, give the good folks at Fee’s a call and see if you can order some — they’re really worth the effort. Another delicious apple brandy comes from Clear Creek Distillery in Portland (be sure to stop into their tasting room when in NW Ptown), which my favorite bartender utilized in nailing the perfect Fall cocktail..
Stir ingredients over cracked ice. Strain into an ice-filled old fashioned glass and garnish with orange peel. *To make cinnamon tincture, soak 4 ounces whole cinnamon sticks in 16 oz grain alcohol for three weeks. Strain solids and bottle. Good to see you're still writing. I've just gotten back in the saddle myself. Certain things were robbing me of my time. And now...I'm FREE. And it's beautiful.